The current tenants are renting unfurnished apartments, but sometime* at least one of the apartments was furnished. Unless the sign was behind the wall because it was such a bad idea. In most excellent news, the smelly sofa bed has made its way into the dumpster.Â (Say, did anyone click through my links yesterday?Â I was expecting at least one comment about the picture of the former tenant’s detritus. )Â It was up in the 50s or 60s yesterday, so the house got aired out.Â And the gas to the stoves in the vacant apartments has been shut off.Â Somehow or other, the house is smelling better. Actually, my brother has been tweaking it.Â Bill is very talented and helpful.Â Besides being my IT go-to guy, roller coaster expert,Â former valet parker, and co-author of the TortsProf blog, he knows everything about children’s rock.Â HeÂ and my niece host Spare the Rock, Spoil the Child, and heÂ is a stringer for Parenting magazine on children’s rock.Â And, apparently, he writes a column for Little Rock (Arkansas) FamilyÂ and Minnesota Parenting.Â He is the cool one in the family.Â I think using this sign in the masthead helps us transition to the blog’s current focus on our Fayetteville house.Â I’ll have to update my houseblogs.net signage, too.Â Thanks, Bill. 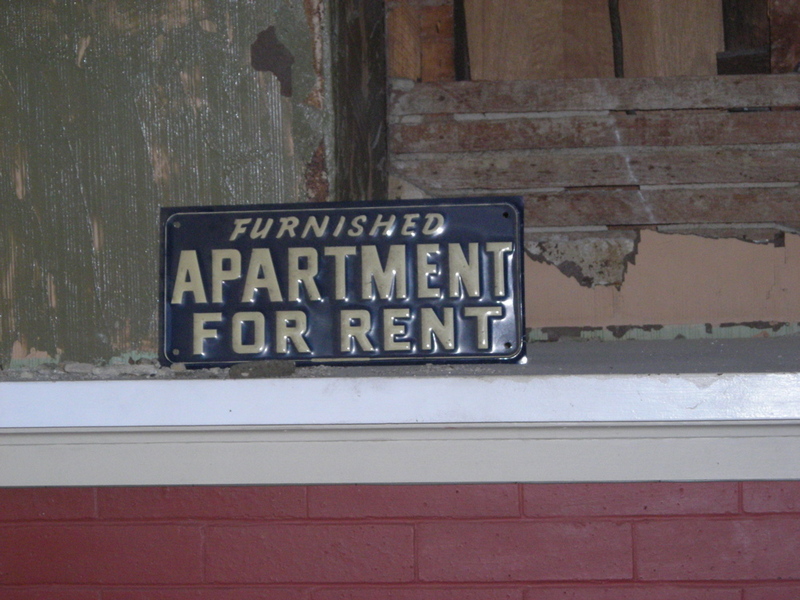 *When did they make For Rent signs out of metal rather than cardboard? I would hazard a guess that we can eliminate during World War II. This entry was posted on Thursday, December 20th, 2007 at 9:08 am	and is filed under Apartment 2, Demolition, Genealogy. You can follow any responses to this entry through the RSS 2.0 feed. You can leave a response, or trackback from your own site. I meant to post the other day, but I think opening up the porches is an excellent idea– it was on the “must have” list when we were house hunting. Porch life is, to me, such a huge part of living in a neighborhood, especially front porch life. There’s no telling what kind of wood is on the floor in there, or what shape it’s in. The early century farm-style house we lived in when I was little always had painted porch floors. The specimen, on the back, is signed Margaret. Can you imagine how that would have happened? And why isn’t there a pair? To be fair, the threshold for “cool” is fairly low in our family, no? Hi, I am a friend of Herman the third. We lived in California and he was like a brother to me. We lost contact and I am really interested in contacting. I know his sister’s name was Cindy Ash. I don’t know what it is now. But his dad owned the Ribhouse. I traveled to Ark. with Dubber one summer. Please help me find my little brother.